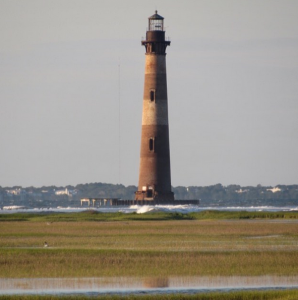 The Morris Island Lighthouse is an icon on the island of Folly Beach. Once a beacon to ships the lighthouse has since become inaccessible due to erosion of the small island upon which it once stood. Today it may be easily viewed from Lighthouse Inlet Heritage Preserve or from any one of the lucky backyards along East Ashley Avenue.